Summer break was over, but we were ready to start the new school year and make more fun memories together! This was a great pick to start off our school year, because MANY of our Egypt and Animal activities doubled as Sonlight activities! Both boys were studying the same things….we LOVE when that happens! Jordan created his title page with a beautiful drawing of La Giraffe. We were ready ready to begin adding to his FIAR lapbook. I created a Bible Verse pack for The Giraffe That Walked to Paris. You can purchase your copy here at our TPT Store. There’s also a FREEbie tracer in the Preview! Jordan traced his Bible verse. Later, I cut it apart like a puzzle and he glued it in his lapbook. He also worked on the Bible verse puzzle many times during this row. We read The Wise King (The Beginner’s Bible app) and talked about the wisdom of Solomon and learning to say the right thing at the right time. I was so excited that Egypt was part of the social studies lessons in The Giraffe That Walked to Paris, because Parker was learning about Ancient Egypt in his Sonlight History. Jordan traced the journey from Egypt across the Mediterranean Sea to France. I set out our Little Passports Egypt package at the kitchen table to kick-start the morning! The kids were SUPER excited to see there was an excavation kit included in the Egypt package. We read Let’s Explore Egypt on our Epic app and I handed out some fun Egyptian printables along with our Egypt Toob figures. The kids worked on their printables and played with the figures. We even took them outside for some Egyptian kinetic sand play! The kids also worked on our Little Passports excavation kit too! Later that day, Jordan and I made mud bricks like the ancient Egyptians. This was a project we wanted to do since last year! I created an Egypt box with a lego build-a-flag activity, Egyptian landmarks, and other items from our Little Passports collection. Jordan added our story disk to Egypt on our world map. We had our version of a French breakfast with Nutella cakes, fruit, and Oui yogurt. We read Let’s Explore France on our Epic app and added our Eiffel Tower to the Story Sensory box. The boys built our Playmobil City Zoo to accompany the lonely Eiffel Tower. The boys used our giraffe figures and world placemats to recreate the journey of La Giraffe. We added the vocabulary words (Aussie Pumpkin Patch) to our lapbook. I created a vocabulary worksheet to give Jordan more practice with the vocabulary for this book. Click here to download your FREE copy today! In addition to our new Singapore math program, we added a fun measuring activity. I created a Measuring Giraffes printable to use during this row. You can download your FREE copy here at our TPT Store. The boys measured with non-standard measuring units (blocks and paper clips) and standard measuring units (centimeters and inches). I set up a special breakfast with fruits and what I affectionately called “giraffe soup” (Kix and Coco Ape-Os). The kids got a kick out of my “giraffe soup” creation. I read our zoo books while they gobbled breakfast. I brought out some zoo-themed file folders that I made during our preschool years. The boys worked on the various zoo activities while I finished reading. Parker used his file folder with letters as a Sonlight phonics activity! 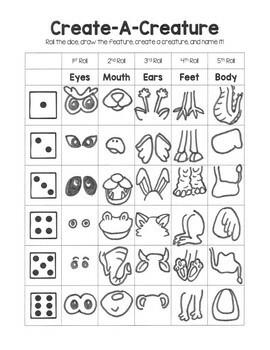 I made a fun Create-A-Creature worksheet for the kids to use. I set out the worksheet with drawing paper, pencils, and die the night before. The kids had a blast with this activity. They kept creating creature after creature. It was cute to see and hear them giggle. While they rolled and created new creatures, I read a bunch of fun animal feature books. I bought Animal Skin Matching Cards from The Montessori Print Shop. The boys took turns matching the cards to our Toob animal figures. As usual, we checked out a TRUCKLOAD of books from the library. The kids LOVED Jolly Tall and Blue & Bertie. It’s always fun to find new stories based on the theme were learning about. We also read some non-fiction giraffe books and I brought out our Giraffe Nomenclature Cards (The Montessori Print Shop). The boys color coded the parts of the giraffe and added it to their lapbook. We read A Friend For All Seasons and started a fun Four Seasons art project. First we traced our hands and I cut out a giraffe head and neck with the remaining yellow paper. Next, I glued their giraffe together and added it to an oversized sheet of white paper and drew four separate tree branches to each corner. The kids finger-painted the giraffe spots and tree branches with brown tempura paint. Once dry, we used blue dot paint to color the background. I precut and punched out tree details (red, bright green, light green, orange, brown, and yellow leaves, pink flowers, and coffee filter snowflakes). The kids used the light green leaves and pink blossoms for spring, bright green leaves for summer, the remaining leaves for fall, and the snowflakes for winter. After they dried, they added the “The Four Seasons” title with foam letters, labeled each season, and added details on their giraffe. They turned out adorable! We opened our book and talked about the sails on the boat, how the ship moves with the wind in its sails, and what happens when the ship is becalmed. We also read a few library books about the wind. My husband bought Zarafa since it was based (more loosely) on the story of La Giraffe. We ordered take out and watched this movie together. NOTE: I would preview it ahead of time since there were some scenes not suitable for all children. We used them as a springboard to discuss right from wrong, other religions versus Christianity and what we believe. I made some gingerbread giraffe cookies and lemonade and served it on a throw in the playroom. The kids were ecstatic when they saw the spread! I read a few more books and they nibbled their sweet treat! Many of our activities were inspired by so many wonderful homeschoolers out there. 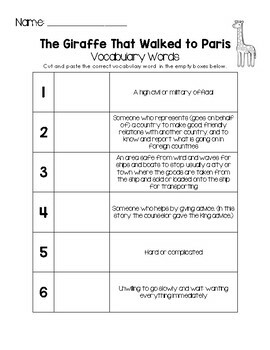 You can find most of the ideas, printables, and activities pinned on our The Giraffe That Walked to Paris Pinterest Board. I created The Giraffe That Walked to Paris Playlist filled with clips about Egypt, France, Giraffea, Zoo Keepers, Citizens, Wind, Seasons, and SO MUCH MORE!